Some fine weather and a good core of volunteers has got us off to a great start at the High Pasture Cave site. 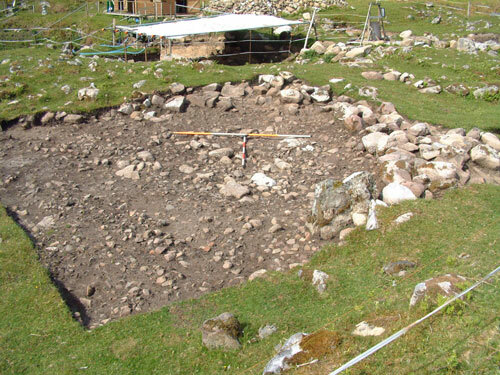 Work so far has concentrated on excavation at the surface, to investigate the extent and context of the burnt mound, and to carry on with work within the deep archaeological deposits immediately outside the cave/stairwell entrance to Bone Passage. The image above shows Trench 15 from the southeast, with the stairwell beyond. 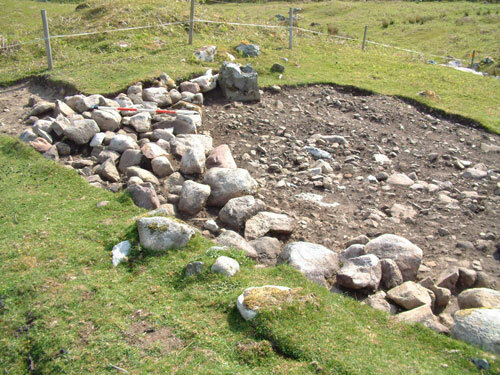 The impressive wall uncovered in 2007 can be seen curving around the area containing the deep ash deposits. 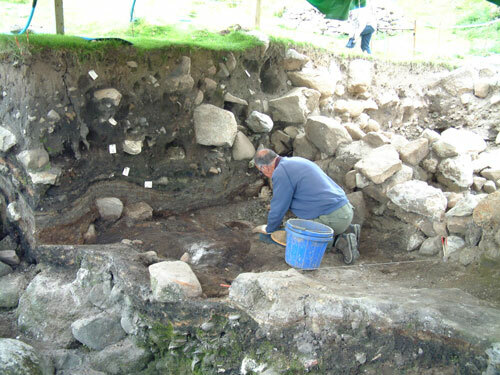 The image below shows Martin Wildgoose excavating the thick layer of grey clay that abuts the wall on the north side. There have been few finds from this deposit so far, but we have recovered a small sherd of coarse pottery and a quern stone; the latter was built into a low revetment built against the north side of the wall in the image above. Work has also continued in Trench 19, which is located to the northeast of the stairwell entrance to the cave. This trench was opened to investigate the extensive burnt mound deposits in this part of the site and a geophysical target that may be an area of paving or a small structure. 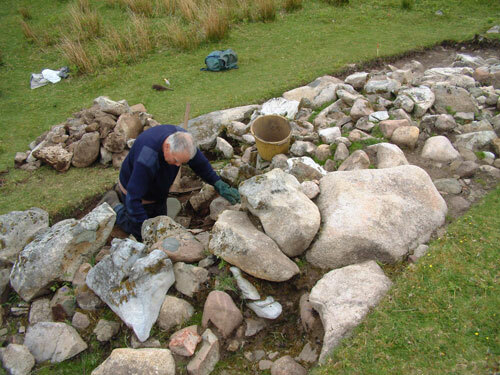 The initial clean of the trench and removal of loose stone and bracken roots has now been completed, during which several small finds were recovered. These included a plano-convex hearth base (iron), iron slag deposits, a fragment of a rotary quern (upper stone), a fragment of a quern rubbing stone, a pebble hammer, a copper-alloy object (possibly a coin), and a fine leaf-shaped arrowhead manufactured from baked mudstone. 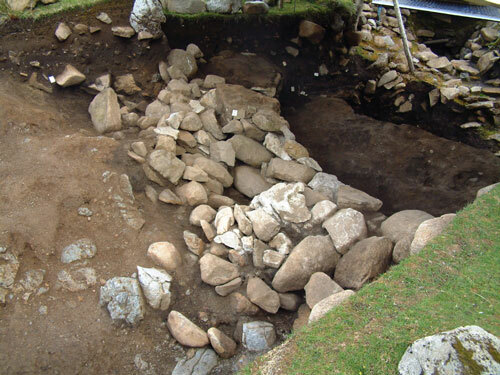 This material has been quarried in prehistory at Staffin in the north of Skye. The image above shows Trench 19 from the southeast, with George Kozikowski setting the scale poles (2m and 1m). The image above shows the trench from the northeast (scales = 2m and 1m). The low wall, manufactured from granite boulders and cobbles, lies directly on top of the burnt mound deposits. The image below shows the same sector of Trench 19 from the west, with the wall evident in the image (scale = 1m). Trench 19 also covers the area to the southwest of the possible main entrance into the site during prehistory. 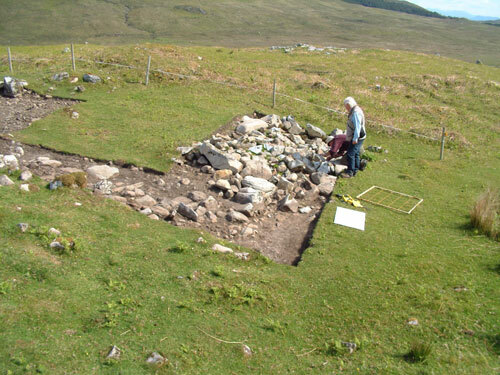 The image below, taken from the east, shows a mass of stone (including some fire-cracked material) that may form some form of revetment wall, holding back the burnt mound deposits to the west (scales = 2m and 1m). 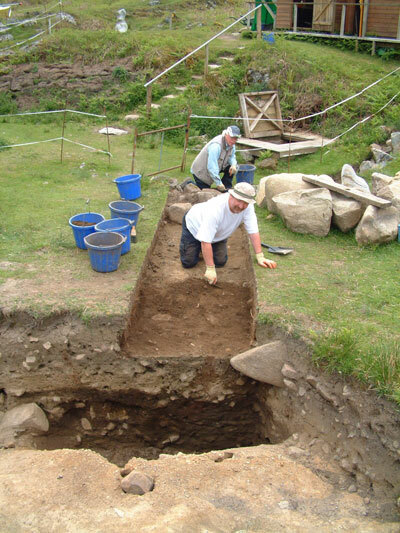 The image below shows another view of the east end of Trench 19 from the southeast, with Martin Wildgoose and David Emmans standing to the side. Charles Burney excavating in the east sector of Trench 19 (below). We have also started an extension to Trench 14, which is in the area of the site immediately to the east of the caver’s entrance. 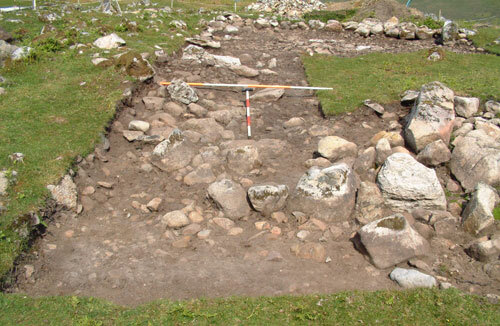 The purpose of this trench is to investigate the extent of the burnt mound in this area of the site and to look at the relationship between the revetment walls that surround this entrance to the cave system. 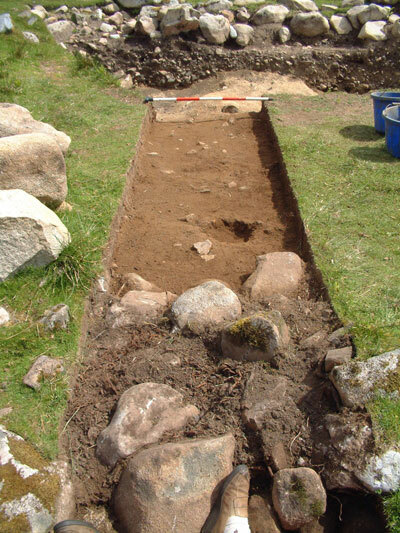 The image below shows the trench after de-turfing and initial cleaning from the southwest (scale = 1m). During the initial cleaning of the trench a small pit feature was found cut into the underlying archaeological deposits. The pit contained recently modern ceramics, bottle glass, fragments of iron, and some crushed beer cans - evidence for more recent rituals taking place at the site! The image below shows Trench 14 from the north with George Kozikowski and David Emmans from Germany excavating in the warm sunshine. It is possible that this material was deposited on site at the time the cavers excavated into High Pasture Cave in 1972. Otherwise, no other finds have been made in this trench as yet, but by the end of today (Wednesday 21st May) the upper surface of the compacted burnt mound deposits had been reached. As a visitor to the site last saturday ,keep up the excellant work. If possible mainly for tourists put up a laminated photo of site and add a weekly update. This should stop visitors going under the electric wire and physically walking on the excavations. 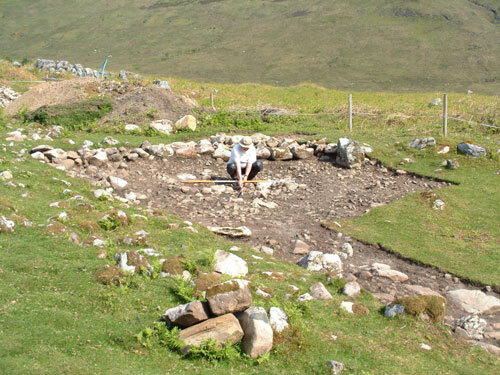 excellent web site, excellent location and amazing dig. We stayed at the Old Croft House just up the Valley past the abandoned Kilbride Crofting settlement in April. I have a couple of photos taken from up the hill to the south which show very well the ground layout at High Pasture which you are welcome to use, let me know if they are of use to you. I hope to be able to join you sometime later in the year as a volunteer.